Winter's Revenge is the second full length Guy Winter mystery. It is set in England in the Second World War at the time of the Battle of Britain and the beginning of the devastating night Blitz of London in September 1940. London reels under the onset of the Blitz as every night hundreds of Luftwaffe bombers unload their cargoes of death over the beleaguered city. On the ground as the new brutal realities of the war are brought home to every citizen, the Ripper continues his rampage and the last secrets of Guy Winter's life are stripped away. As the bombs fall the mystery man unravels one mystery after another, knowing that sooner rather than later he must confront his deadliest foe. This time it is not just Guy Winter's life and loyalties that are under the microscope. Under the Luftwaffe's reign of terror the past mistakes of friends and enemies alike suddenly come home to roost, but Guy Winter never stops hunting his man. 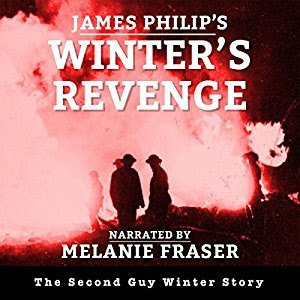 The excellent narration by Melanie Fraser made listening to Winter's Revenge most enjoyable. The story picks up where it left off in book one and it gently unfolds as Guy Winter's hunts the person responsible for his wife's murder. There is some rehashing of events that happened in previous books, slowing the pace of the plot a little bit too much for me, however the twists and turns kept my interest in the story and the suspense towards the end of the book had me on the edge of my seat.